PopATot. This is a tool, play station, and baby holder all in one. I keep it in my car and find myself using it anywhere and everywhere, all of the time! 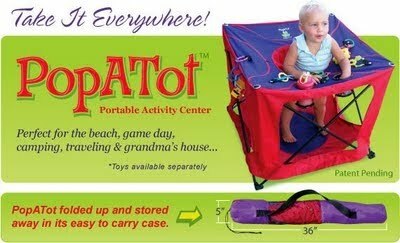 The PopATot is a portable activity center for children ages 6-18 months that is lightweight, safe, and folds up for carrying and storage in a matter of a few seconds. 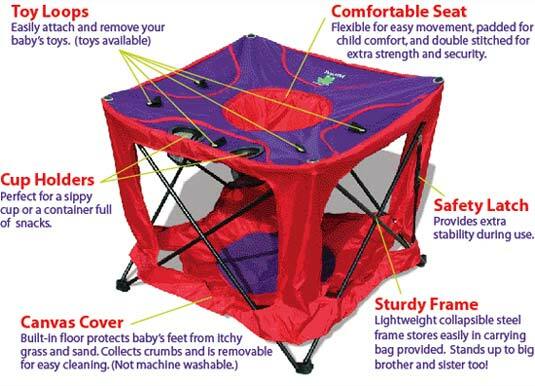 Originally designed by a family that liked camping and needed to keep their infant away from the campfire, the PopATot has undergone rigorous development and thought to now bring the public a handy dandy way to keep their little ones safe and happy! When using the PopATot in public, I always attract a crowd of women wondering what it is, and wanting to know where they can get one. It was especially handy over the holidays with all of the traveling and my needing to bake in our kitchen but not wanting my baby to be running around a hot oven. There aren’t too many items that I use both in my home and outside of it! While it’s been too cold to use the PopATot outdoors yet, I’m very much planning on using it this spring and summer as we travel to my husband’s softball games (at last–I won’t have to chase my child the entire time! )…and I can’t wait to bring my babies camping with this thing! One thing to remember is that your child will need to be able to support his or her self in a sitting position before being able to use the PopATot. With a spot for cups and attachment places for rings and toys, the PopATot keeps things in good proximity of your child. The only thing I found that I don’t like is that the weight of LoveBug brings the top surface down to her at an angle, so nothing can rest by itsef (make sure toys are attached or they’ll just slide toward your child!). I would love to see a lipped plate be made that could attach to the PopATot so that the child could eat finger food or something while in the seat, instead of food rolling towards the seat! The PopATot comes in a variety of colors and prints, and also can be ordered with special baby sized parosols that attach to the base. This way, your child can be shielded from the sun! I don’t have one of these, but I think it’s a smart idea. Overall, I think this is a great product that’s easy to use (open and close with one hand!) and clean (just shake and wipe off). It’s perfect for families on the go or who live in small houses and can’t fit a traditional activity center. While you’ll have to take the initiative to provide your child with toys while in the PopATot (as opposed to an activity center that already has things built into it), I think that every new parent will find that life is easier when you’ve got this in your car with you. Buy It! Visit http://www.popatot.com/ to view there selection. The PopATot is on sale right now for $49.99. AND, there’s a 100% Satisfaction Guarantee or your money back. Check website for details. Or if you go through Amazon by clicking here: PopATot , you will be eligible for free shipping and a free 1-year magazine subscription (check link for details)! Win It! First, you must be a follower of Life More Simply. Then, visit http://www.popatot.com/ and let me know what color/print you’d like. If you win, that’s what you’ll be getting! Contest will end on Thursday, 1/28/10 at noon, EST. *Otherwise spread the word (tell me how)! I like the primary colors. I like the camo with brown trim. I'm pretty simple, so I would love to win the Primary Colors PopATot. Thanks for the chance! Emailed some friends and cc'd you. I'm a follower. I like the Pink/Leopard one.